… [A] student said to Master Ichu, "Please write for me something of great wisdom." Master Ichu picked up his brush and wrote one word: "Attention." The student said, "Is that all?" The master wrote, "Attention. Attention." The student became irritable. "That doesn't seem profound or subtle to me." In response, Master Ichu wrote simply, "Attention. Attention. Attention." In frustration, the student demanded, "What does this word 'attention' mean?" Master Ichu replied, "Attention means attention." 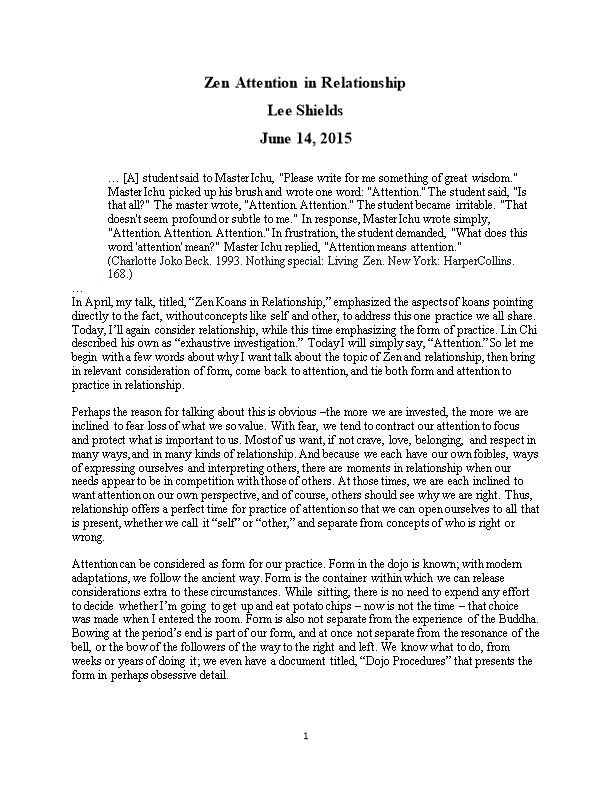 In April, my talk, titled, “Zen Koans in Relationship,” emphasized the aspects of koans pointing directly to the fact, without concepts like self and other, to address this one practice we all share. Today, I’ll again consider relationship, while this time emphasizing the form of practice. Lin Chi described his own as “exhaustive investigation.” Today I will simply say, “Attention.” So let me begin with a few words about why I want talk about the topic of Zen and relationship, then bring in relevant consideration of form, come back to attention, and tie both form and attention to practice in relationship. Perhaps the reason for talking about this is obvious –the more we are invested, the more we are inclined to fear loss of what we so value. With fear, we tend to contract our attention to focus and protect what is important to us. Most of us want, if not crave, love, belonging, and respect in many ways, and in many kinds of relationship. And because we each have our own foibles, ways of expressing ourselves and interpreting others, there are moments in relationship when our needs appear to be in competition with those of others. At those times, we are each inclined to want attention on our own perspective, and of course, others should see why we are right. Thus, relationship offers a perfect time for practice of attention so that we can open ourselves to all that is present, whether we call it “self” or “other,” and separate from concepts of who is right or wrong. Attention can be considered as form for our practice. Form in the dojo is known; with modern adaptations, we follow the ancient way. Form is the container within which we can release considerations extra to these circumstances. While sitting, there is no need to expend any effort to decide whether I’m going to get up and eat potato chips – now is not the time – that choice was made when I entered the room. Form is also not separate from the experience of the Buddha. Bowing at the period’s end is part of our form, and at once not separate from the resonance of the bell, or the bow of the followers of the way to the right and left. We know what to do, from weeks or years of doing it; we even have a document titled, “Dojo Procedures” that presents the form in perhaps obsessive detail. We have no such document for practice in relationship, though we can extrapolate. While engaged in formal sitting we bring our attention to the practice, you to yours, and me to mine. Whether that relates to the breath, a koan, sound, or a question such as “Who hears?” While cooking we bring our attention to chopping, washing, stirring, and tasting. Attention in the kitchen is open. Getting lost in the chopping might mean scorching what is in the pan on the stove. So our attention includes all that is appropriate. What is appropriate will likely exclude some things as well. If talking to someone in the passenger seat while driving, it is appropriate to notice the response of ourselves and that person; it would be most unfortunate to leave out the other cars on the road and traffic signals. Because we don’t have a document in the TTS file titled, “Relationship Procedures,” and we don’t have an ancient way that offers a specific container, I offer the topic today as something we can consider together. Even though I’m sitting in this seat with a small lectern, I can’t and don’t speak with authority on this subject – there have been too many teachers and leaders in all religions, and other endeavors, who acted inappropriately in their relationships. But I will offer my thoughts, and then today, and over time, I’d like to explore together what the form of our practice can be when in relationship, whether each for ourselves, or commonly shared. There is a great freedom in Ichu’s teaching. Attention is enough. We come to the dojo with an intention to focus. We apply ourselves by engaging with our breath, our koan, with this sound. In this room we can more often have clarity regarding “attention means attention.” When we are sitting diligently on our cushion, and start to smell lunch in the next room, what might arise is “hunger.” So far, so good regarding attention. We have all sat long enough to know what might next arise – “I wonder what’s for lunch,” then, “damn, when is she going to ring the bell?” And perhaps, “Maybe I’ll pick up something for dinner on the way home…”…and off we go. At some point we stop…returning to breath as our expression of attention, as befitting this moment. It is not hard to distinguish food shopping reveriesfrom attention to breath. Granted, this is not the whole picture either. Yes, I can attend to my breathing, and by so doing start to slow down, shedding anything extra, and finding my way to breath. Though even saying it the way I did implies something extra. I may begin by experiencing myself sitting, breathing, and experiencing attention –there is no denying any aspect of this. At the same time, completely opening to stomach growling, mind wanders, without the need for an actor attending, or thing attended to, attention becomes an expression of one state. But I don’t know anyone who always rests in the experience of one state. Thus we have form and practice to support us. Attention does not require forcefulness, attention allows receptivity. This talk now is an opportunity for receptiveness, not because what I have to say is so important, but as receptivity practice, without effort. Attention does not require an expectation of understanding – just taking it in, which might include, “I don’t get what he’s saying.” No judgment is needed. In fact, listening to this talk would fit neatly in the theme of attention as a practice in relationship. It is up to us together to come to understanding. Just receptivity carries the simplicity of Ichu’s “Attention means attention.” In the spirit of simplicity, there is no need to take this attention as if it is written in all capital letters, or highlighted by a ring of fire. It is enough to notice what is here. Though we may be seduced into making something of this attention, it remains simple. Even in the luxuriously simple dojo, where all is carefully chosen to support practice, there is the formal practice that helps guide us, and the songs of the horns, tires, and engines calling us – nothing extra, nothing left out. There is no conflict or discord between Master Ichu’s teaching, and breath, as long as our attention is without limits to anything that is. And here, from 17th century Japan, Hattori Toho, a student of Basho’s, first quoted his old teacher and then explained the meaning with respect to writing poetry. “Learn about the pine from the pine, learn about the bamboo from the bamboo.” This dictum of our teacher means that you must forgo your subjectivity. If you interpret “learn” in your own way, you will end up not learning. To “learn” here means to enter the object; then if its essence reveals itself and moves you, you may come up with a verse. Izumi Shikibu, Li Po, Basho, and Hattori Toho all demonstrate how attention can involve not two. These examples also reflect due time, and attending to what is present now. However useful these concepts of form and practice can be, by their application we release them. Each time we engage with form – in this case, attention – we may start sitting with the mountain; letting all fall away leaves only mountain. According to Basho, encounter the object; encounter what arises. And yet, there is still room for discernment. If Li Po were to become hypothermic sitting with mountain, I would have hoped he would have attended to the chill instead. In the west, it is no different. What was Monet doing when he painted scenes of stacks of wheat and the Waterloo Bridge over and over, if not practicing attention? And what of the painters over centuries, sitting together with the Grand Canal in Venice? All of these examples are more similar to sitting together in the dojo, taking time, settling in. Just as Monet can pull out another canvas for another time of day. The bell rings and we sit together, following the schedule, with attention, and being attention. Let me return to the practice of listening to this talk is an opportunity for receptivity. Whenever listening to others, it is easy for anyone to think what you do or don’t agree with, what words you would say, or whether you’re engaged or waiting for me to get to the point. Even if those responses are valid, open attention includes not just your response, but listening for what is true for the speaker. What is the path of your mind as you listen? Are you receptive, fitting these very circumstances? Merrick: … [Romeo] does not care for Juliet. Merrick: Does he take her pulse? Does he get a doctor? Does he make sure? No. He kills himself. The illusion fools him because he does not care for her. He only cares about himself. If I had been Romeo, we would have got away. Merrick: If he did not love her, why should there be a play?...That is not love. It was all an illusion. When the illusion ended he had to kill himself. Merrick: Before I spoke with people, I did not think of all these things because there was no one to bother to think them for. Now things just come out of my mouth which are true. Mrs. Kendall: [To Treves] Fredrick, I feel Mr. Merrick would benefit by even more company than you provide…Mr. Merrick, it has been a great pleasure to make your acquaintance. Both plays viscerally show us the depth of attachment in relationship – what better place for practice? Recognizing that this play is fiction, I nonetheless value through the resonance within me that there was relevance to the story. For both Merrick and Kendall, attention meant attention – there was no need for explicitly articulated definitions. Every day, in our own lives, we brush by a myriad of people and things, casually and intimately. I know people who found that very experience in India so painful they ended what was to be a long trip after a day. The open attention to obvious suffering was too much to bear. Perhaps to force one’s self to bear the unbearable would be like forcing one’s self to sit cross-legged so long one’s body is damaged, or to focus on a formal practice to the exclusion of what is. It would not be for me to evaluate the discernment for these folks in India. More commonly, we all know times we choose something other than being present with anyone, or someone in particular. That too is discernment of that to which we attend. So far I’ve been setting up the more specific question to which I wanted to address together today. Every day, with the people in your life, and for me in mine, what is Zen practice? It would be limiting to relegate practice to the cushion, when as lay folks we live in the world, and in relationship. Don’t we all, wherever we are in our practice on a given day, want to, and have a responsibility to, show up in the marketplace with gift-bestowing hands? Abraham Lincoln wrote, “I care not for a man's religion whose dog and cat are not the better for it." Speaking for myself, bringing practice to relationship is not a matter of obligation, or belief, but the inexorable direction to which I’m drawn. If you are drawn in another direction – do not be distracted by what I say. Though perhaps you will find something of how I let my feet find my way that will also apply to you on yours. Similarly, I would be grateful to hear from you how you find your way in what is your practice. Even if you also are drawn to bring form to your practice in relationship, there may be many ways to do so. The Buddha way is not exclusive. How could it be so when central to it is the simple and unqualified statement, “All beings are Buddha.” This fundamental understanding is inherent in Ichu’s Attention. Ichu saw no need to say more than “Attention.” For that one word to be sufficient, includes the understanding that with open attention, all else will follow, including discernment of what is attended to, what actions are taken, and the falling away of he or she who is attending. This is not to say that we should presume that right or ethical action is automatic. As with all things, we find the middle way, neither asceticism nor indulgence. In this case, whether in personal dojo practice or relationally, we might say the middle way of attention lies between rigidity and indulgence. If rigidly setting rules as to what is attended to, we risk erring. I mentioned an example of this in my last talk when describing how in a monastery I practiced in, doing diligently mindful bows before accepting tea water left someone awkwardly holding a heavy tea pot at arm’s length. Being indulgent is not hard to imagine either – I was so enjoying the music through my ear buds. Oh, did it matter to you that I swung open my car door and dented your car? And in relationship, the middle way is open to all that is, with focus on that which is central, and abandoning with discernment but not judgment, that which is peripheral to what is present. Such open attention calls for courage to observe what may be surprising, inconvenient, or abhorrent.